It hadn’t really sunk in until William crushed the vial into his palm, but biological warfare makes a poignant Americans metaphor. Germs are just the right weapons of mass destruction for a show of this scale, and the way lassa fever destroys William from the inside is what the agents of Directorate S are supposed to be doing to the United States. There’s a crucial difference there, though: The illegals are supposed to chase destruction with change. William’s microscopic “unwelcome guest,” by contrast, just leaves behind a leaky corpse. When the antibodies swarm to flush William out of the U.S., the process is depicted in fine detail. We’ve seen this sort of thing from The Americans before: It’s the slow-speed car chase from “Open House,” or Matthew telling Paige that catching spies is “more than car chases” in “A Roy Rogers In Franconia.” The protocol of monitoring and capturing William—and William’s decision to break his meeting with Philip—makes up the cold open and engulfs most of the first act. It’s a complicated scene, requiring a lot of cross-cutting and traffic management. And it wants to make sure we’ve been paying attention. Faces we’ve seen maybe once or twice pass in cars and on the sidewalk: the man in the park from “Roy Rogers,” the woman with the yellow ribbon. Hans leads the KGB caravan. Mixed in are reminders that none of these characters enjoy the omniscient POV from which we’re monitoring the scene: While Stan and Aderholt are staked out in front of William’s building, the scene plays out in the lenses of Stan’s binoculars. He has eyes on William, but that’s it. Once William gets picked up, the Jennings won’t have that luxury. They head into the hiatus not knowing if he’s alive, if he’s dead, or if he’s ratted them out in order to save his own skin. It’s life-and-death drama, but it resonates to the show’s emotional core, too. William’s acting selflessly when he contracts lassa so no one else has to (there’s something messianic about those wounds in his palms, right?) but that means Elizabeth’s work with Young-hee and Don was definitively in vain. Like William’s fate, she’s still in the dark about this, but it’s a devastating development in an episode where Elizabeth is told that her biggest weakness might be that she cares too much. There’s another sharp angle to the bioweapons metaphor: the “bio” part. Whether they’re volunteering for the gig or not, all of these characters are carrying some sort of ticking time bomb within their body. The way Philip talks at the EST meeting, it sounds like he’s dealing with depression. Elizabeth has a hair trigger and knows lots of ways to kill people. Paige’s attraction to the boy next door could be extremely dangerous to her family. Some of this stuff just comes down to biology. “Persona Non Grata” finally introduces us to a hidden member of the Jennings family: Philip’s son (with Irina) Mischa makes his first onscreen appearance in the finale, and he has issues with being told what to do—just like dear old dad. Mischa is a curious wrinkle in the extra-long episode, a presence who isn’t quite a character yet but helps the show usher in a new chapter. Superficially, Alex Ozerov is expertly cast, bearing as much physical resemblance to Matthew Rhys as Holly Taylor bears to Keri Russell. Fresh off a post-Afghanistan stay in a mental-health facility (where he was sent for “complaining publicly about our military support for the brotherly people of Afghanistan”), Mischa is heading to America to find a family. His timing could be better: With William’s whereabouts unknown, Gabriel has begun pushing for the Jennings’ extradition. This scenario has always loomed over the house in Falls Church, but it’s always seemed like a remote possibility until now. Just given the way The Americans has always operated, it seemed likelier that Philip or Elizabeth (or both) would be killed or arrested before The Centre arranged one-way travel accommodations for the rest of the family. But as the show sets up for its final act, going “home” feels like a viable ending. But, as the Jennings have wondered these past two weeks, would they even recognize home? The place where they live now isn’t looking all that friendly: In the lingering shot that brings season four to a close, Chris Long makes the Jennings estate look like the Amityville Horror house. It’s a vivid grace note for these 13 episodes, in which the Jennings could’ve been undone by so many under-the-radar threats—but they managed to maintain the façade of the average American family. Families are expanding and contracting and intertwining. In a hospital room, Paige meets Pastor Tim and Alice’s daughter, Claire Louise, and their shared happiness suggests a nuclear family that isn’t. The Rezidentura clan is losing two of its own, as Arkady gets snared by counterintelligence and Oleg makes his mother happy by agreeing to go back to the US (back to the US, back to the US) SR. After Stan catches the kids necking in the afterglow of Washington’s sound Super Bowl defeat, he jokes to Philip about Matthew and Paige getting wed in the backyard. But the real joke’s on the American dream: The Soviet spies managed to stay together, while Steve Rogers is the one who tore a household apart. And now their daughter and his son are locked in a Cold War Romeo-and-Juliet clutch, stars-and-stripes-and-sickle-and-hammer-crossed lovers. Now I’m getting theatrically poetic, but this is an episode and a season that call for it. There are connections between “A Roy Rogers In Franconia” and “Persona Non Grata” that make season four’s final episodes something of a two-parter, not the least of which are the dramatic monologues sprinkled in among the tension. Philip and William each get to find their light and deliver a speech this week, the theatricality of these moments enhanced by their staging. Philip’s on an actual stage for his, while William pitches his words to an audience of two. Captured in close-up, the actors unlock a black-box intimacy, particularly Dylan Baker, who explains a lot about William in the character’s dying words. “I was committed to something, and I was invisible” the unwelcome guest says on his way to departing. His presence was undetectable to the naked eye, exposed only when symptoms presented: a disappearing FBI secretary, the body of a former counterintelligence director, an assumed name lifted from another corpse. But he failed, and he lost faith, because he was alone. He lost what Philip and Elizabeth have: a sounding board, a support system, a someone to love. Increasingly, Philip and Elizabeth don’t have what William had. The seams of their illusion are starting to show, and they must take drastic action before some Masked Magician comes along to blow the lid off how they made the Statue of Liberty disappear. Mischa gets to return to his grandfather because “powerful friends” want to help him, but the Jennings are losing friends of any kind. Young-hee, Martha, even someone as tangentially connected to their mission as Arkady. They must unite at home, they must keep vigil from the upstairs window—they must not fraternize with the floppy-haired informant across the street. Taking place during one of the Cold War’s hottest years, season four brings The Americans to a boiling point. Yet it does so without leaning too heavily on its ’83 touchstones: President Reagan’s SDI speech is an occasion for mockery, a nuclear false alarm is pillow talk, the tragedy of South Korea Flight 007 is bypassed by a time jump. Certain landmark events—The Day After, for example—affect the characters’ day-to-day, but so do David Copperfield specials, crummy computer games, and the death of someone thousands of miles away. The Americans always does good work with the stuff that appears microscopic on the historical scale, but massive on the personal level. And now it’s 1984. Arkady is out. Wolfe is in. During the Super Bowl, a new wave jogger tosses a sledge hammer through Big Brother’s face. The future is coming, and The Americans has reset itself for it—whether the Jennings are ready or not. That’s it for TV Club coverage of The Americans’ fourth season. Stay vigilant during the hiatus, comrades, and we’ll see you here next year. In the meantime, why not read a finale postmortem with showrunners Joel Fields and Joe Weisberg? 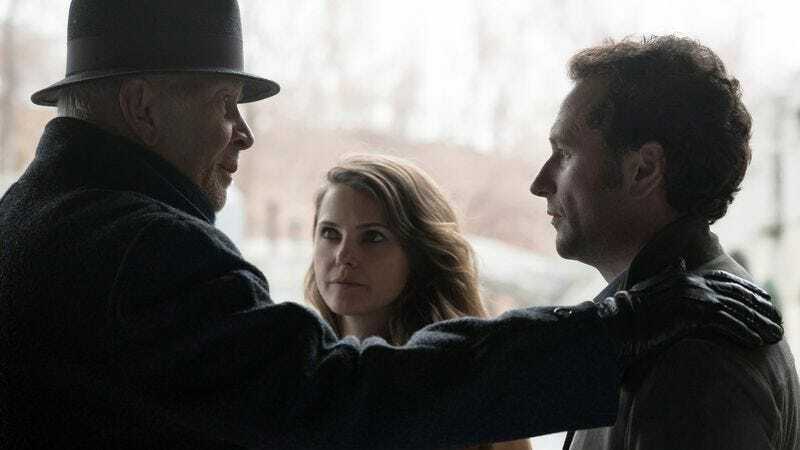 The Americans Wig Report: Season Four, Week 13: C. Limited missions means limited disguises, so Philip’s back in pre-diagnosis Walter White mode again. If the Jennings must go on the lam, here’s hoping they bring the wigs with them. The Americans Soundtrack Report: Season Four, Week 13: A-. 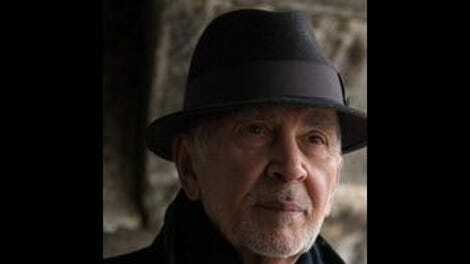 Leonard Cohen serenades a juxtaposition of birth (Paige and Claire Louise) and death (the KGB careers of Elizabeth, Philip, and Arkady). It’s redemption for Cohen after his mistreatment at the hands of #TrueDetectiveSeason2, in a montage that redeems brooding over brown liquor, too. Was there any Mail Robot? And who, by electricity, shall I say is whirring through the background of the “previously on”? How do the Jennings sleep at night? Elizabeth is awake in bed when Philip returns from the aborted meet with William. And now, another new Americans TV Club feature: “O say can you see?”: Ironic uses of Old Glory in The Americans: Elizabeth comes home with the dry cleaning, and a small American flag hangs fuzzed out in the foreground. Did we know that Irina had been arrested before “Persona Non Grata”? Did Gabriel let Philip know about it when he told Philip about Mischa? Wolfe’s teardown of Arkady is fantastic. I love when he calls Philip marrying Clark “The lowest thing I have seen in my entire life.” If he only knew the full extent of Directorate S.